Teddy’s mother doesn’t just come back wrong. She’s not his mother at all but an eldritch abomination with creepy putty flesh who’s unkillable and can possess everyone who’s a parent, turning them into gross goopy minions. What’s worse is that she can stop adults from perceiving her true form, so when Billy and Teddy do the rational thing and go to the Avengers for help, the Avengers can’t tell that anything’s wrong as the possessed parents imprison the two of them in a pocket dimension. Kate Bishop, AKA Hawkeye: has the best origin story ever. Under attack in Avengers Mansion, she ransacks the various rooms and grabs a bunch of random stuff to fight back, including one of Hawkeye’s bows. (He was dead at the time and not using it). No powers, but she’s cool enough not to need them. The team is on the run from “Mother,” only fighting when they get cornered because she’s so mind-bogglingly powerful. 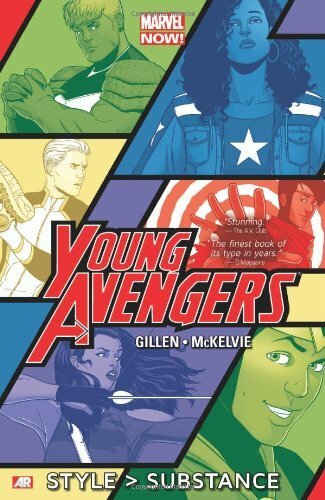 By the climax, the Young Avengers are making a last stand in Central Park as Mother possesses an army of people from all over New York, including the (dead) parents of some of the team members, who are superheroes, alien warriors, and a frost giant. It’s not a fight they can win by force. The entire book is tense, and Mother is a really creepy villain. She’s calm and pleasant the entire time, scolding the kids for misbehaving and saying such gems as “Everyone agreed it’s best you and my lovely boy come home with me so I can feed on your souls until you’re nice and dead inside” with a smile. There’s something especially uncomfortable about seeing Captain America and the other Avengers stand by and do nothing as she assaults Billy and Teddy. Plus, the way her skin turns to goop and smothers people is just wrong. There’s no shortage of teenage drama and angst (I joke, but there are some really good character moments), and if you’re a fan of witty dialogue and banter, you’ll be a very happy reader. While this graphic novel has a bit too much character backstory to be a good book for new comic book readers, if you have at least a passing familiarity with Marvel Comics, I think you’ll enjoy it. The characters are awesome, the tone energetic and fun, and there are some really creative panels that make full use of comic books as a medium. If you like sci-fi or YA fiction, grab a copy of the first volume. And let me know what phase of the MCU you think we’ll have to wait for to get a Young Avengers movie.